How do we recognise Jesus? Do we expect him to look like we see him in our icons? The answer Jesus himself offers in that parable is that we see him in the least of his brothers and sisters. But he is not only a brother to the least; he is also our brother. We need him as much as any of the least! So they drew near to the village to which they were going. He appeared to be going further, but they constrained him, saying, “Stay with us, for it is toward evening and the day is now far spent.” So he went in to stay with them. When he was at table with them, he took the bread and blessed, and broke it, and gave it to them. And their eyes were opened and they recognised him; and he vanished out of their sight. They said to each other, “Did not our hearts burn within us while he talked to us on the road, while he opened to us the scriptures?” And they rose that same hour and returned to Jerusalem; and they found the eleven gathered together and those who were with them, who said, “The Lord has risen indeed, and has appeared to Simon!” Then they told what had happened on the road, and how he was known to them in the breaking of the bread. Walking with the two disciples, still unrecognised by them, Jesus responds to their sadness and confusion by going back to the scriptures – meaning, of course, the Hebrew Scriptures, what we call the Old Testament. The two disciples are intrigued by how this stranger understood the scriptures, so they ask him to spend the night at the inn where they are staying for the night. They sit down for dinner. And that’s where it happens. “He took the bread and blessed, and broke it, and gave it to them” – and their eyes were opened. They immediately recognised him – but just as immediately he vanished from their sight. “Did not our hearts burn within us while he talked to us on the road, while he opened to us the scriptures?” Yes their hearts burned on the road, he touched them deeply as he opened their eyes to the meaning of the scriptures. But they only recognised him at the table, when he blessed and broke the bread and gave it to them. They immediately remembered how he did the same when he fed thousands, every time he sat down to eat with his disciples, and how he took the bread, blessed, broke it and gave it to them at the last supper. It was at dinner that they recognised him. It’s always a dinner at the heart of Jesus’ teaching – a communal meal. We recognise Jesus when we are a community. When two or three are gathered in my name, there I am with you,” he promised. The two disciples going to Emmaus were two, and he came to them. We are two, three, fifty-three… We are a community, a communion – koinonia. Not just a community as an incorporated entity,. 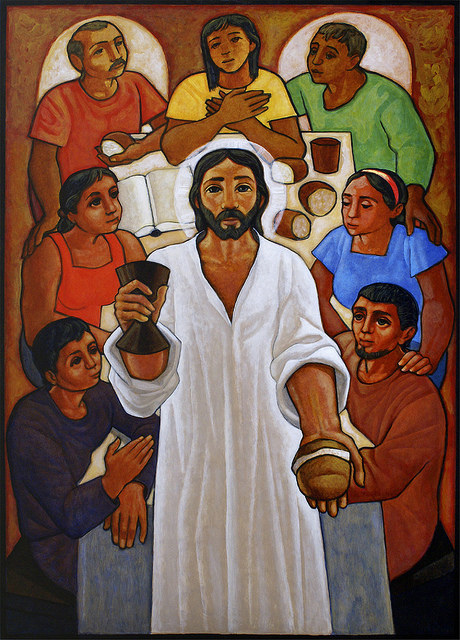 but a living organic communion of people – diverse in so many ways, but united by the presence and bread of Christ. Dear friends, fellow believers in Christ Jesus. For many years my friend Leon Nicholas, a child of our churchcommunity and one of my altar boys years ago, has been telling me exactly the same thing: Rootless, isolated teenagers and young men are the ones most likely to go on a shooting rampage and the easy availability of deadly weapons makes it all too easy for them. Imagine, teenagers can’t drink legally but they can buy weapons of mass destruction. Of course they still drink – illegally – but that’s not an excuse for not changing some of the laws applying to gun purchases. No, Leon has been right all these years that we have discussed social problems, and we talked again yesterday over coffee. Community is the key. An actual eucharistic community, that meets regularly, shares the same meal that Jesus shared with those disciples, and works together to manifest the grace and peace that only Christ can give. The peace that is beyond human understanding (Philippians 4:7). Categories: In the news, Sermons | Tags: breaking of bread, Emmaus, Florida school shooting, isolated youth, New York Times | Permalink. Everything begins with forgiveness. Authentic life begins the minute we are able to forgive and receive forgiveness. Until then, all is theory and talk. The key moment on the Cross was when Jesus looked out at the soldiers and crowd and spoke the words, “Father, forgive them, for they know not what they are doing.” Our salvation was sealed at that moment. Everything that comes after that, including 2,000 years of church history, is just footnote to those words Jesus spoke on the Cross. But most of us don’t know that we are forgiven, and we go through life lurching from day to day, bouncing back and forth from one professional help to another, from one religious expert to another. So I like to describe Lent this year as our voyage of discovery, the discovery that we are forgiven. But also the discovery of what we do with our forgiveness. How does it affect our lives, our attitudes and actions? This is what I want to explore in this series of Lenten sermons that I’m calling Emmaus Walk. Many years ago I was doing a 15 or 20-minute teaching every Sunday morning between the end of Matins and the beginning of Liturgy. 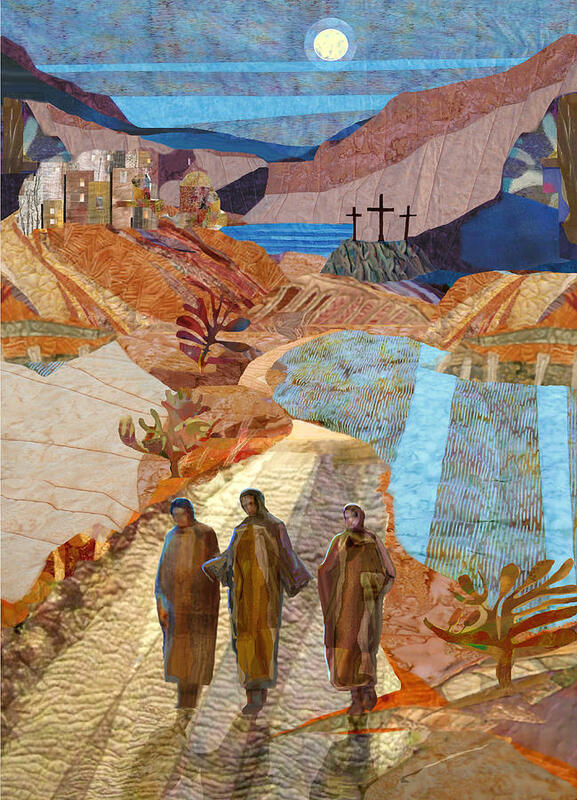 I called it Emmaus Walk, a preparation for encountering the risen Christ at the Liturgy. The series of sermons I’m now calling Emmaus Walk will take us to Easter. But along the way I want to discover together with you the Christ who is walking with us every step of the way. The scene describes where most of us are most of the time. We have heard about Jesus Christ. We have listened to many Gospel readings in the Liturgy. We hear some of our friends and relatives talking with great conviction about Jesus, how their faith in him has transformed their lives. We go to church regularly, we follow some traditions handed down by our mothers or grandmothers. But we don’t quite know how to put it all together. We don’t know quite what to make of this Jesus Christ and all the talk about him. We don’t know why we follow certain traditions or how to pass them on to our children or grandchildren who have a different approach to life and who don’t worry about the same things we worry about. We begin to have doubts ourselves. Maybe it is all a myth after all. That’s where Cleopas and his unnamed companion were on that Sunday afternoon long ago. (And by the way, why does the second, unnamed disciple have to be another man? Why couldn’t it have been a woman, as the beautiful but very unusual – very “un-Orthodox” – icon on the right imagines?) They had seen Jesus die on the Cross, they were deeply troubled by how things ended, they are confused and sad. They saw all their hopes disappear on the Cross. But now they hear that some women had found the tomb empty. They keep walking, not knowing what to make of it all. Only one person can explain it to them – Jesus himself. He joins them in their walk, but they don’t recognise him. Perhaps his appearance was different after the resurrection? What happens after he joins them we’ll explore in the next few sermons. Only Jesus can satisfy our questions, our doubts. And he does come to us. We don’t recognise him, because he comes to us as one of the least of his brothers and sisters as we heard last week in our Gospel reading (Matthew 25:31-46). Very often the answers we need at a particular moment come from the most unexpected persons. This is the mystery of the unrecognised Jesus. The mystery of the unrecognised Christ is all around us. We just need to open our minds and hearts to see it and hear it. Christ is with us – usually in the least expected places and persons. We might see him in the person we forgive or who forgives us. We might hear his wisdom from the mouth of a child. We might understand his Cross in a tragedy such as the one in Florida this past week. Everything is a mystery of his presence, his unrecognised presence. Categories: Sermons | Tags: Emmaus, forgiveness | Permalink. 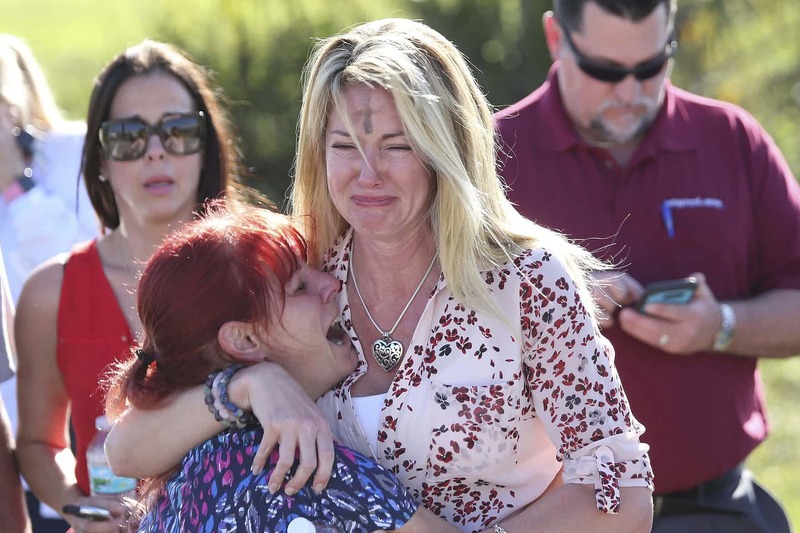 Among the most poignant scenes from yesterday’s carnage in the Marjory Stoneman Douglas High School yesterday were grieving and anxious parents with ashes on their forehead. Yesterday, of course, was Ash Wednesday, the start of Lent for Roman Catholics and Episcopalians. This is how the website bibleinfo.com summarizes the meaning of Ash Wednesday: Roman Catholic churches of the Latin Rite use this service to prepare church members to better appreciate the death and resurrection of Christ through self-examination, repentance, prayer, fasting, and self-denial. Ashes from the burned palms of the preceding year’s Palm Sunday are blessed. With these ashes, the priest marks a cross on the foreheads of worshipers, saying, “Remember, man, that dust thou art, and unto dust thou shalt return” (Genesis 3:19 KJV). Besides showing sorrow for their sins, those who honor Ash Wednesday add an additional meaning; the need to prepare for a holy death. Yesterday was indeed a day of huge sin and a horrible encounter with death. So many young lives, full of promise and energy, cut down by the bullets of one angry, hate-filled youth! The images of parents with ashes on their foreheads were a blunt reminder that we are very much a human race that is still sunk in sin, despite the salvation and grace that God poured upon us through the death and resurrection of his Son. Lent is the time in which we prepare to confront the death and resurrection of Christ every year. But Christ told us last Sunday that he is in every one of the least of his brothers and sisters, and what we do to the least of his brothers and sisters we do unto him. It was Christ who was murdered yesterday in those 17 lives. Not just a liturgical commemoration of his death this time; but an actual, dark reminder that we live in a death-culture society. Yes, I’m sorry if that strikes some of you as an exaggeration or unnecessarily pessimistic, but there is no other word for it that I can think of. We are a death-culture society! Death has become a constant in our society: Gun deaths, terrorist deaths, drug-induced deaths, poverty-driven deaths, refugee deaths, unborn deaths, environmental death and deaths…and the death of morality, of civic responsibility, of communication, of accountable political leadership…Need I go on? Flags at half mast. Have you noticed how many times flags are at half mast every year? Yes, half mast. It doesn’t cost anything to fly flags at half mast. A sign of national humility? Perhaps. But the arrogance comes right back up a few days later. And the forgetfulness. We shrug our shoulders and move on – until the next round of bullets at a school or at a concert or a party or a troubled home. Nothing changes, except the statistics which become more brutal every year. Second Amendment they say. I can assure you that the Founding Fathers of this nation never envisaged a future such as ours or weapons such as ours in the hands of teenagers and people with mental problems. Talk about gun deaths in this country and you’ll be criticised for now getting “political”. “Political” – a nice label people resort to when they don’t want to confront reality. I weep with those parents with ashes – and the many others without ashes – in Parkland, Florida. I wish the Orthodox Church had an Ash Wednesday to start Lent. Every year, it’s becoming more and more clear that there are forces that aim to foreshorten human life and to return us to dust and ashes prematurely. Let’s make this Lent a time not for self-improvement and weight loss, but a time for reaching out to this death culture to transform it in any small way we can. Make this Lent a time to reach out to anyone who is troubled, to someone who is alone and needs the human touch, a kind word, a positive vision of life. Although I’m pessimistic about the death culture around us, I’m very optimistic about our power to transform it. Let’s make this Lent a time of resurrection power in the midst of sin and death. Agape and Shalom to you today. Categories: Global Visions, In the news | Tags: death culture, school shooting | Permalink. I’ve always been puzzled and somewhat amused by the choice of readings on this Meatfare Sunday. And by the way, that is a terrible English version of the Greek name for this Sunday: Κυριακή της Απόκρεω. Apokreo means “from meat”; in other words, leave-taking of meat, saying goodbye to meat! “Meatfare Sunday” almost sounds like a Sunday dedicated to celebrating meat! The Epistle reading for this Sunday was presumably chosen by monks because of Paul’s line about not eating meat. But Paul’s statement has nothing to do with Lenten fasting! As always, it’s the context that we fail to recognize. It was customary in Corinth at that time to sell meat in the marketplace that had been offered in the pagan temples. So many Christians in Corinth were offended to see a fellow Christian eating such meat. Paul had no qualms about eating such meat, but if it meant that weak Christians would be offended (scandalized), he would give up meat. “Therefore, if food would cause my brother or sister to fall, I will never eat meat, lest I cause my brother or sister to fall.” Paul’s concern is for the other, for the brother or sister, and this text is the opposite of the usual Lenten focus on my own spiritual condition. The Epistle and Gospel today tell us that the focus is the other, the brother and sister. And that is the real meaning of Lent. The message is the exact opposite of the self-righteous, self-absorbed, finger-pointing Christianity that comes so easily to us. If God is with us, how can life go on as usual? This is Matthew’s overall message. God is with us and nothing can be the same again. And yet Jesus near the end of his earthly ministry told his disciples, “the poor you will always have with you.” The poor will always be among us as a challenge, as the fulcrum for judgment. The Parable of the Sheep and Goats is the “God is with us” judgment. Poverty is unacceptable to God. It is unacceptable because God created everything to be good. God created a world, a universe, that is abundant in all the necessities of life. I believe that before long, life will be discovered in other parts of the universe. I believe I will live to see proof that there is other life in the universe. And that will only show yet again that God is the God of abundance – not only here on our earth, but throughout the universe. God’s purpose for us is to have life and have it abundantly. Those were Jesus’ words. So when people, God’s children, are denied the necessities of life, it is tragedy and sin beyond measure. The parable was indeed the beginning of the end for Jesus. But did you notice the beginning of the parable? “When the Son of Man comes in his glory, and all the angels with him, then he will sit on the throne of his glory. All the nations will be gathered before him, and he will separate people one from another as a shepherd separates the sheep from the goats….. Does that mean we are not judged individually? No, we are judged as individuals, but also as members of a nation, a society. What are the nation’s priorities? How do our personal priorities fit in? Is it hard to clothe the naked, to welcome a stranger, a homeless person into your home? Is it hard to visit a prison? And by the way, all English translations say “stranger” in this parable. But the Greek word is ξένος, which more accurately means foreigner, alien. All the things Jesus lists in this parable are difficult for most of us. But are they too difficult for a society, a nation? God says, No – there is no excuse for a nation to neglect the poor, the hungry, the homeless, the sick, the foreigner! No excuse. But wait, what about the church? We are a society. Jesus placed the church in the world not to massage our egos, but to enable us as a group, as a community, to do what we can’t do as individuals or as a nation. Can’t we as a church do the things Jesus speaks in this parable? Can’t we feed the hungry, clothe the naked, give shelter to the homeless, visit the sick and the prisoner? Why are we not more involved in soup kitchens? Why are we not out there advocating for the homeless and the refugees? 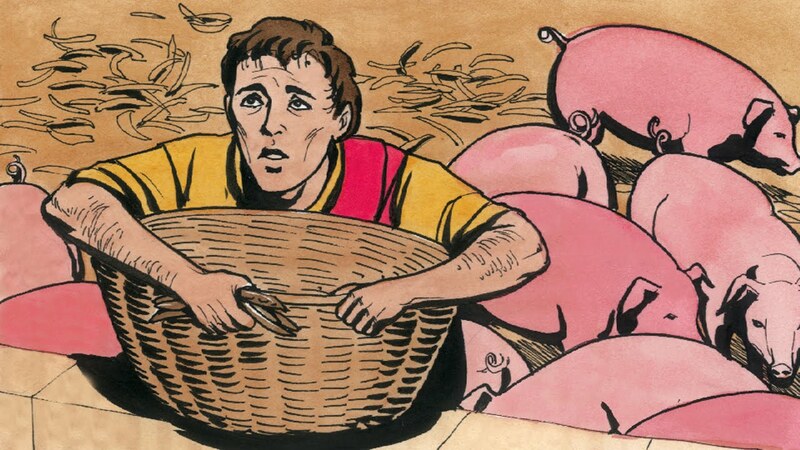 Why do we call the poor lazy? Surely we can find ways to fulfill Jesus’ commands? Surely he is not asking us to do the impossible. Take something like ministry to prisoners. While it may be much harder to visit prisoners now than it was centuries, or perhaps even decades, ago, a ministry to prisoners is within the ability of every church. I remember many years ago Eula Chrissikos, despite her severe physical disability, used to visit regularly a prisoner at the state penitentiary, a man who was serving a life sentence for murder. I went along with her on one or two of her visits. The church is capable of many things, but not so that we leave a calling card behind everything we do, so we receive thanks. Not to us, Lord, not to us the glory or the thanks. When, Lord, when did we see you naked or in prison? This is not a parable to depress us, but to challenge us to new faith. Every year we read this a week before Lent begins to remind us that Lent is not about our needs, but the needs of people around us. We are on a journey to Easter, but on this journey we encounter the other – whoever the other happens to be. 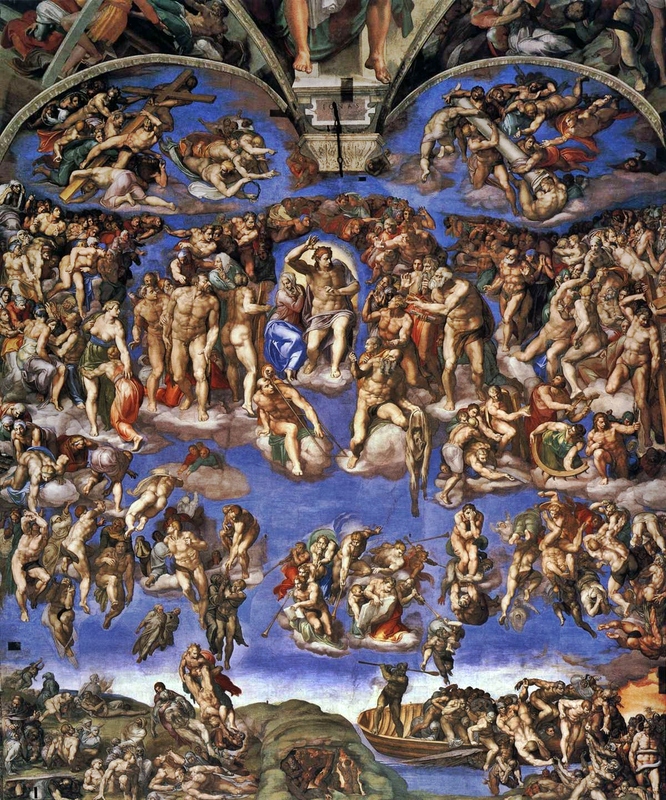 Categories: Sermons | Tags: Last judgment, parable of sheep and goats | Permalink. I read an incredible story in the Washington Post. A man is trying to get his son’s death sentence commuted to life. What was the son’s crime? He conspired with two other men to kill his parents and his brother! The mother and brother were killed and the father barely survived. The father forgave his son from the beginning, and is now begging the governor of Texas to commute his son’s death sentence. In many ways it reminds me of the Gospel parable of the prodigal son. It’s a story of sin, self-awareness, love and repentance. Who is more prodigal, the son in his sinfulness or the father in his forbearance and love? I’ve asked that question in other sermons in the past, and my answers is of course the father, he’s the real prodigal in this story, and he reflects the prodigal, excessive love of God the Father and his Son our Lord Jesus Christ. One could even call Jesus the prodigal son of his Father. Prodigal in love, humility and self-sacrifice. We read this parable every year as part of the church’s preparation for Lent. But the monks, who over a thousand years ago decided what Gospel readings we would read at the Liturgy, got it wrong. This is a story of repentance, but not the kind of repentance monks preach. Therefore you have no excuse, whoever you are, when you judge others; for in passing judgment on another you condemn yourself, because you, the judge, are doing the very same things. You say, “We know that God’s judgment on those who do such things is in accordance with truth.” Do you imagine, whoever you are, that when you judge those who do such things and yet do them yourself, you will escape the judgment of God? Or do you despise the riches of his kindness and forbearance and patience? Do you not realize that God’s kindness is meant to lead you to repentance? Focus on that last statement: Do you not realize that God’s kindness is meant to lead you to repentance? This question strikes me as the key we have ignored. We are taught by church tradition that repentance is about us grovelling to God and begging for forgiveness, which God then gives to us because he is kind and loving. Paul says it’s the other way around: It’s God’s kindness and goodness that leads us to repent! A very crucial difference, in my opinion. 2 Cor 7:9-10 Now I rejoice, not because you were grieved, but because your grief led to repentance; for you felt a godly grief, so that you were not harmed in any way by us. For godly grief produces a repentance that leads to salvation and brings no regret, but worldly grief produces death. Crucial contrast: ἡ γὰρ κατὰ θεὸν λύπη…ἡ δὲ τοῦ κόσμου λύπη. 2 Tim 2:25 And the Lord’s servant must not be quarrelsome but kindly to everyone, an apt teacher, patient, correcting opponents with gentleness. God may perhaps grant them repentance so they may come to knowledge of the truth. So Paul basically says that two things lead to repentance: God’s kindness and the grief that comes from God κατὰ θεὸν. The only repentance that has any chance of producing genuine faith is the repentance that arises from God’s kindness and the grief that God plants in our souls. It is not repentance that we manufacture in ourselves in order to bargain with God. What kind of repentance did the prodigal son experience in the parable? He was hungry, he missed being in his father’s home where he could eat anything and as much as he wanted. “But when he came to himself,” Luke tells us, he decided to return home. He came to himself, εἰς ἑαυτὸν δὲ ἐλθὼν. That’s not repentance; that’s just awareness of how hungry he was and how well fed he was at his father’s home! He goes home, speaking his well rehearsed speech – as a form of bargaining – to his father, who doesn’t even listen to it. The father is not interested in grovelling and long speeches. He has been waiting in love and ready to pour all his kindness on his son. He doesn’t even say I forgive you. He is all kindness and love. And it is here, I believe, that repentance happened in the son, although the parable says nothing more about him. I bet he also experienced that godly grief that Paul wrote about. It’s left to us to picture the scene and what transformation happened in the soul of that young son. The older son objects to the easy way the father took his son back, and the father teaches him also the ways of God. This is repentance, dear friends: To receive the love and kindness of God. Let the kindness of God lead you to repentance. If Lent this year does nothing else than reveal the kindness of God it will be a transformational. time. Let it begin here at the Liturgy, where God waits to embrace us and clothe us with love and mercy and the grace of our Lord Jesus Christ. What it came down to was receiving compassion from the people that I least deserved it [from], when I least deserved it. Just before I left the movement, I opened a record store to sell white-power music that I was importing from all over the world. In fact, I was one of the only stores in the United States that was selling this music. And I also knew that to stay in the community and get their support I would have to sell other music. So I started to sell punk-rock music and heavy metal and hip-hop and when the customers came in to buy that music, who were often African-American, or Jewish, or gay, at first I was very standoffish, but they kept coming back. The community, even though it’s Chicago, everybody knew what I was doing, everybody knew how hateful I was and how violent I was, but these customers came in despite that. And over time I started to have meaningful interactions with them, for the first time in my life. In fact, I had never in my life engaged in a meaningful dialogue with the people that I thought I hated, and it was these folks who showed me empathy when I least deserved it, and they were the ones that I least deserved it from. I started to recognize that I had more in common with them than the people I had surrounded myself for eight years with — that these people, that I thought I hated, took it upon themselves to see something inside of me that I didn’t even see myself, and it was because of that connection that I was able to humanize them and that destroyed the demonization and the prejudice that was happening inside of me. Categories: Biblical Explorations, Sermons | Tags: God's kindness, parable of the prodigal son, Repentance | Permalink.